Professional, friendly, and helpful. Dr. Chew replaced the plastic part of my glasses' nose bridge (without me asking)because my new puppy destroyed one of them when I was napping! Thanks so much! Professional, friendly, and helpful. Dr. Chew replaced the plastic part of my glasses' nose bridge (without me asking) because my new puppy destroyed one of them when I was napping!Thanks so much! Dr. Chew is efficient and very personable. I've gone to her for my last two annual eye exams and she's alwaysbeen a joy to be around. I will use her as long as I'm in SF. Dr. Chew is efficient and very personable. I've gone to her for my last two annual eye exams and she's always been a joy to be around. I will use heras long as I'm in SF. Dr. Theresa Chew is a native of San Francisco, California. She attended the University of California in Berkeley and completed her undergraduate degree in 1987 with a Bachelor of Arts in Biology. Dr. Chew received her Doctor of Optometry degree from Pacific University College of Optometry in 1991. 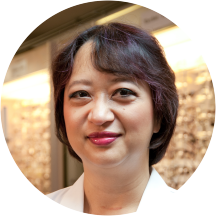 Upon graduation, she returned to the Bay Area and practiced Optometry in private practices until 1995 where she created Crystal Clear Vision Center Optometry, Inc. With over 25 years of experience, she specializes in Primary Care Optometry and Contact Lenses. Dr. Chew enjoys many pets, including 9 cats, 2 chinchillas, 2 finches and many beta fishes. She is a certified cake decorator and an avid crafter, which includes jewelry design, garden design, rubber stamps, photography and scrapbook design. At the practice, there is an on-site lab with 1-hour service on glasses! Clear , concise , hassle free, caring, kind, attentive , listens well. Quick, efficient. Very experienced treatment from a great professional. I look forward to the next appointment! It was easy to book and change times with the Zocdoc app. Dr. Chew is an expert in her field and it shows. She showed me the difference between my old and new prescription as well as recommended lenses for mylevel of use. Her staff explained my coverage clearly as well as helped me pick out frames that work with my face. I had a really amazing experience with the staff and doctor. They were very helpful, and I cannot express how grateful I am with them. My significant other had a great experience and was impressed with the care she received. Sept. 2018 Visit Friendly, knowledgable, helpful staff. Dr. Chew is personable and accommodating. Thorough and efficient but doesn’t rush. She takes very good care of her patients and provides sound advice. This is a small office in the NorthBeach neighborhood with bus and parking garages nearby. I’ve gone in twice for exams and bought frames with progressive lenses. Decent selection of frames, but no high end designers. Fair prices. Probably not for hipsters. Very pleasant staff all around. Great doctor! Very kind and thorough. This is a great place, a real community center where they served the needs of families in the neighborhood and people come to socialize. Even though I’m not Chinese I got an awesome vibe and she employs local young people whoare also super helpful and up and coming. Make sure to buy at least one pair here this year this is a real bedrock of the community! Dr. Chew was very professional and helpful. I was seeking new contacts and was very accommodating meeting my needs. My appointment lasted no longer than 30 minutes and I was able to receive everything from a general examination to my contactsand glasses prescription. I will definitely be seeing her again for any eye-related needs. Dr. Chew was friendly and communicative about every procedure during my exam. She answered all my questions and gave really good explanations for everything for I needed clarification. The office staff was super friendly. They were attentive to all my needs as I shopped for glasses. great listening skills and offered helpful suggestion for me to make a good choice on what type of contact lens that will fit my lifestyle. The best experience I’ve had at an optometrist! Dr. Chew was very friendly and informing, her staff was welcoming and very helpful with picking out frames. They explained which frames best fit my face and answered all my questions. waited for a bit, but not a problem. Dr. Chew was super sweet and accommodating. Great bedside manner. Dr. Judy Chun was very efficient and thorough in performing my eye examination! Dr. Chew listened to me so well and responded in kind. I have ridiculously sensitive eyes and have trialed several contact lenses with various different ODs and finally settled on a daily that was fairly comfortable. In one visit Dr. Chewadjusted my script and gave me two new types on contact lenses to trial and they felt much better! All in one visit! After my previous experiences this was a refreshing surprise. One of the lenses was a very new line that just came out. I ordered through the office because not only did online stores not have the newest lens, the alternative lens she also prescribed was actually cheaper through the office than on any online retailers I researched. The entire office staff (including Dr. Chew) are very welcoming, kind, and extremely helpful. When my contact order was delayed I called them to see if there was any problems. The woman I talked to (I with I could remember her name!) was very attentive and she contacted the company and called me back to update me on the issue. She had even helped me get free shipping on my order even though it didn't qualify. The frames selection is lacking (but who orders glasses at their OD anymore anyway?) and the office is a little cluttered, but I would highly recommend Dr. Chew's office. I'm so glad I found them so close to my place! I thought the doctor and the staff were all very nice. She still saw me right away after I showed up late. I dont think I would go back. I dont like the atmosphere of this office, nor did I feel like the assistant helping me was very qualified. Everyone was very nice and accommodating. The staff and doctor were all very professional and courteous with my service dog and me. I'm definitely going here next time I need an eye doctor. Overall it was quite satisfactory. Dr Chew was amazing and answered all my questions. Already made another appointment. Would recommend her for sure! The staff were friendly and professional! Dr. Chew is very efficient and makes the eye exam experience comfortable by explaining each step and what will happen. She,s great, so is the staff! Dr. Chew was extremely efficient, nice and had me in and out quickly. My eye exam was thorough and she answered all my questions. The office staff was also very friendly. Highly recommend. I enjoyed the visit very much. The administrative staff was efficient, friendly and very helpful, especially when they had to look up my VSD information. I waited less than 10 minutes before I was called. Dr. Chew was very friendly, herexam was thorough and quick. She answered all my questions. I will go back again. My first visit and it was great. Receptionist was quick at getting me set up, and Dr. Chew was solid. She has helpful tips and advice, didn't push any sales for contact lenses or whatnot, and was very nice overall. Very good experience. Dr. Chew was courteous and professional, answered my questions and made the exam a pleasure! Not impressed with the wait time. What's the point of having an appointment? The doctor was professional and did a thorough job. She was very nice and casual. She was understanding of my needs and she spoke clearly and directly. She was very straightforward and efficient, and I was in and out of the office quickly. She was maybe the best eye doctor on the planet !! she really cares ! !